If you look at my tweet cloud of the words I say the most “excited” is by far the number one. I’m usually excited about something. If I’m not, I get completely melancholy about how I have nothing to look forward to. 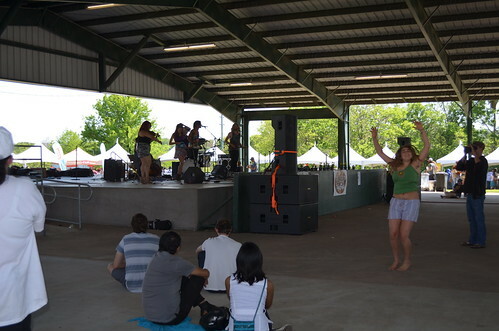 For Texas Vegfest I think I might have just been too excited, I missed it last year because it was my bff’s wedding and thought that was one of the best events of my life, missing vegfest and hearing all about it just built up the anticipation even more for this year’s fest.. 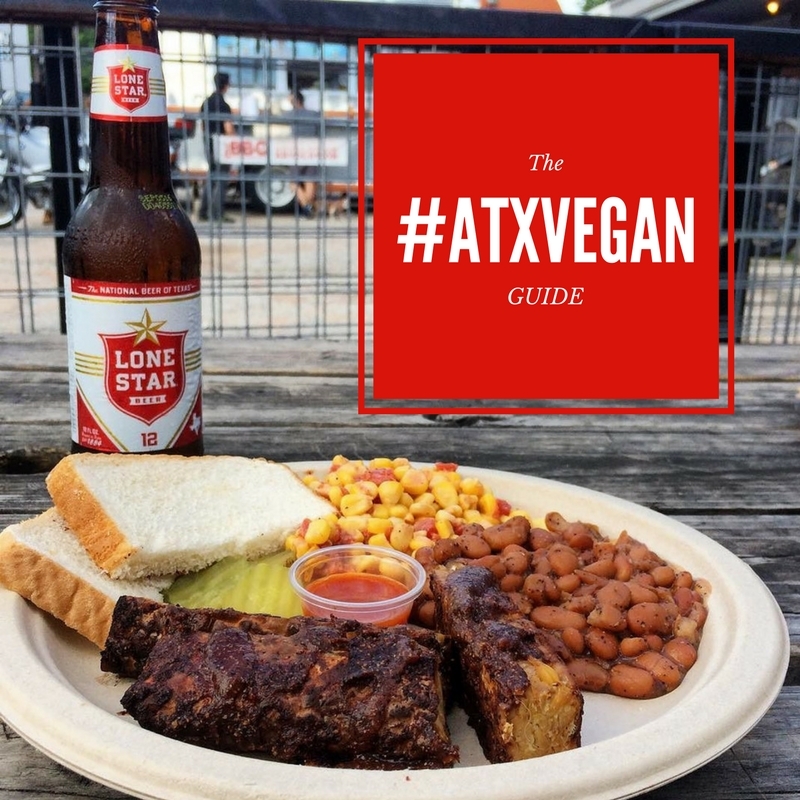 The night before I went to ATX Vegan Drinks with my friends from North Austin Vegans and had a fun time playing trivia even though my team abandoned me for the final round. Saturday was a freaking gorgeous day and by the time I finally got to the fest I’d already missed some events and sat down to see Dr. Montgomery talk about cardiology. 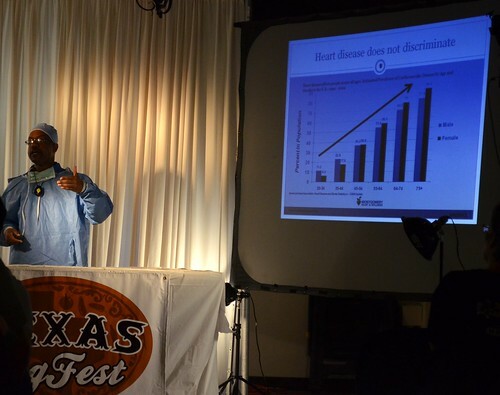 He was a great speaker, he talked a lot about how preventable heart disease is just by cutting back meat and that a lot of people know that and just replace beef with chicken. It’s not enough! He was dressed in his surgeons gear just in case any meat eaters showed up. I wanted to pay close attention but I just couldn’t sit still. I really wanted to get a shirt from Herbivore before they sold out. Then I got distracted by tacos. 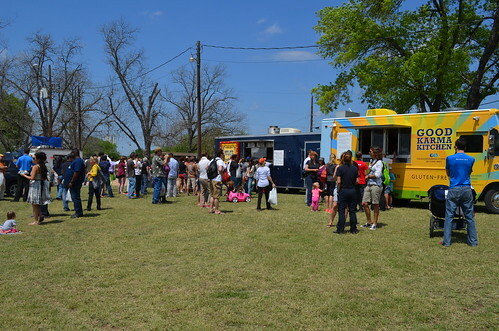 Good Karma Kitchen had rolled in from Fort Worth to bring us their delicious tacos and noodle dishes. 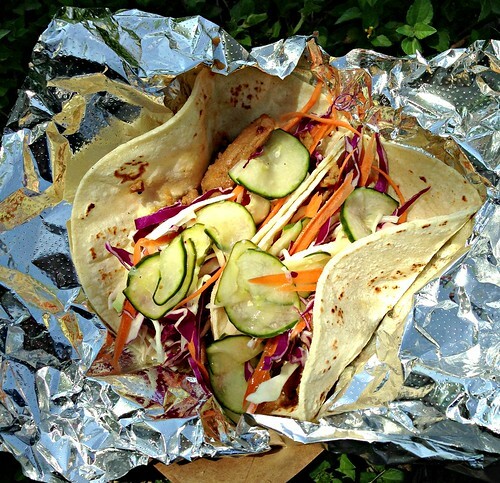 I got the barbecued Korean tacos with jalapeno cream sauce, sliced vegetables, and ginger pickles and they were amazing, and my favorite thing I ate all day. I couldn’t believe the line for Arlo’s next door was a million times longer since Arlo’s is usually parked just down the street. They do have my favorite veggie burger in the world and people were waiting over an hour! 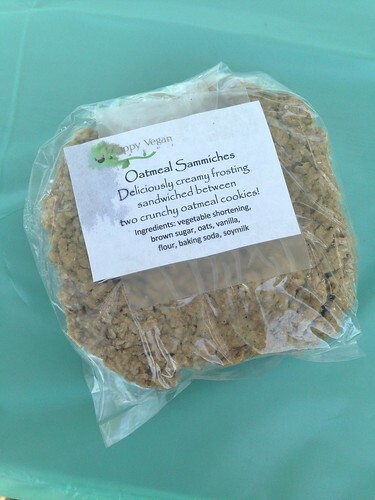 I went looking for the Herbivore booth after trying some tempeh on a stick and then I ran into friends who wanted something sweet. 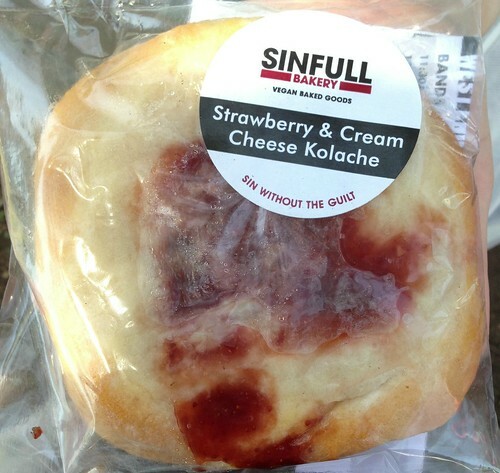 We headed to Sinfull Bakery, I was stoked to finally try their Kolache after not being able to find one on a recent trip to Houston. I also tried one of their dark chocolate cookies and both were fabulous. There were 5,000 people there and I saw so many folks that I have met over the years. It was sweet to see so many kids. Actually, my favorite story of the whole day was hearing about a teacher that brought a group of her school children to volunteer for the day. Apparently she takes them to different places every other weekend to help out in the community and they had never even heard the word vegetarian before. They were really excited to see Omowale talk about boxing and wanted to try some of the food, but the teacher didn’t have the money buy them all expensive festival food and mentioned she would have to take them somewhere cheap like KFC. 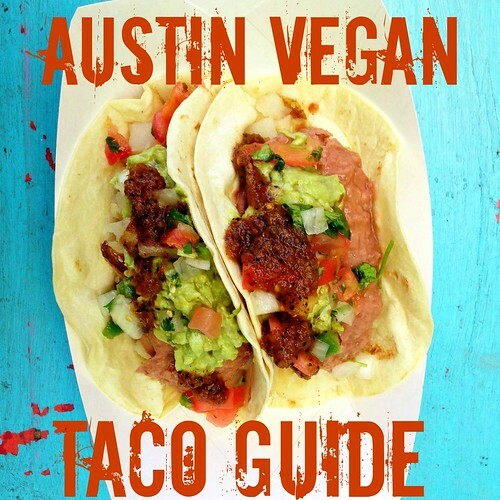 The Texas Vegfest staff heard about this and pitched in to buy them awesome local food from the vendors and they loved it! Meanwhile I was spending tons and tons of money gorging myself and Dan. 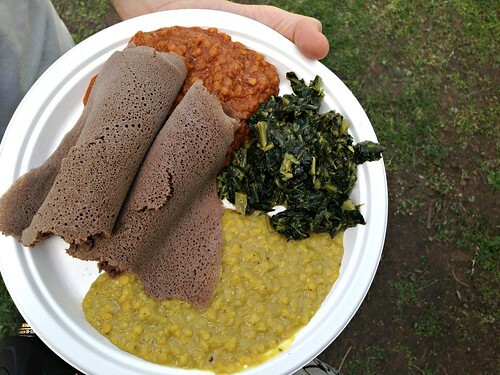 I got him a plate from Aster’s Ethiopian because we don’t get up there enough and we love it. But then I remembered I wanted to hear Colleen Patrick-Goudreau speak about how we are all taught to have compassion for animals but then we are taught to eat them too. She such an inspiring speaker. 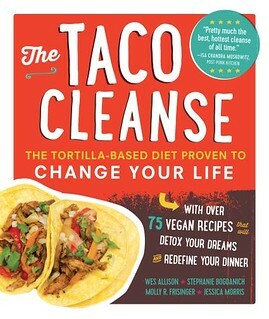 If you are considering trying to go veg I recommend checking out her 30 day program and her cookbooks. Halfway through the talk I remembered that I still hadn’t gotten my Herbivore T-shirt and by that time they had ran out of the one I wanted! Damnit! At least I’ll be in Portland soon enough. I drowned my sorrows in funnel cake. and I got completely covered in powdered sugar. 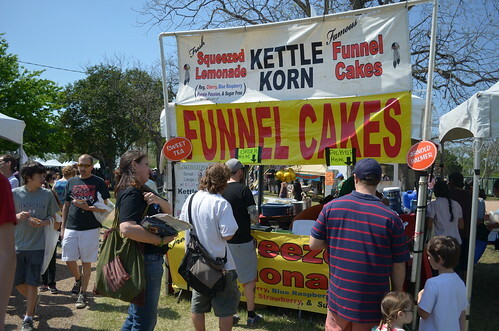 The funnel cake completely did me in and I bought more treats for later. And I missed so many other places I wanted to try. 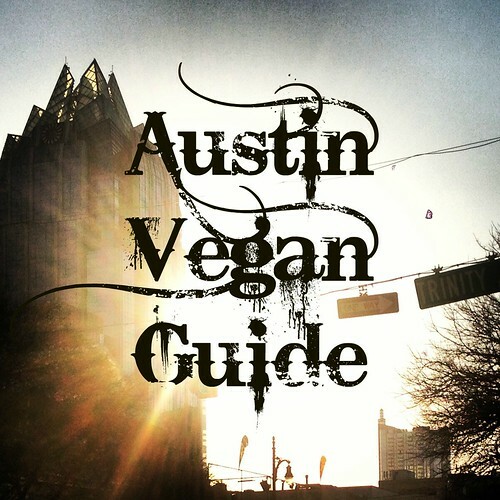 Mostly Unity Vegan Kitchen which I head everyone raving about. And the Happy Vegan Baker’s Mac & Cheese. And Capital City’s Cheesecake. And Counter Culture’s Sweet Potato Salad. And Sweet Ritual’s Salted Carmel ice cream in a Waffle Cone. There was a lot of food. I was so sunburned and exhausted I had to go home. It was all too much. 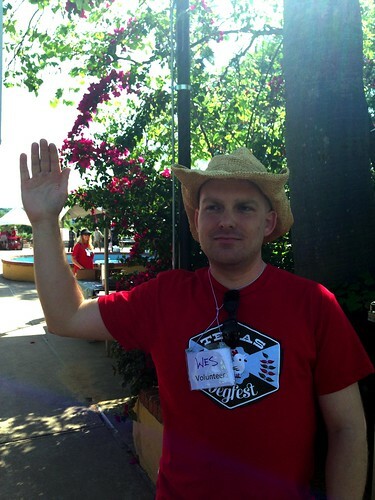 As we were walking out Dan said, “you know the only vegan I didn’t see was Wes” and then there he was, waving to us goodbye Big Tex style. 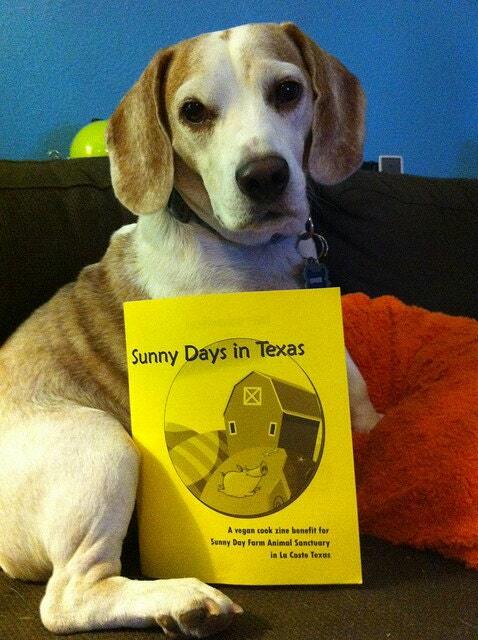 This entry was posted in Austin, Events and tagged Austin, Texas, Texas VegFest on April 8, 2013 by lazysmurf. 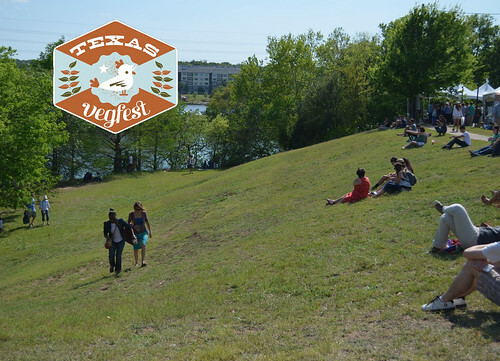 Texas Veg Fest looks AWESOME!! 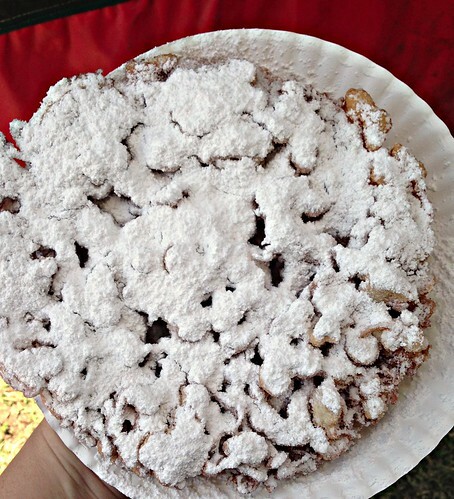 I love that you guys can hold your fest’ outside and that there was funnel cake! 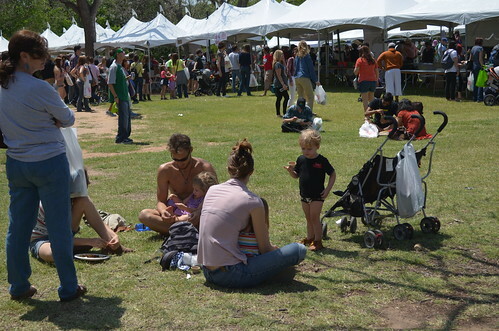 It was so wonderful to be in good company at Texas Veg Fest. We’ll have to meet up next time! Sounds like you had a blast! I know I did. 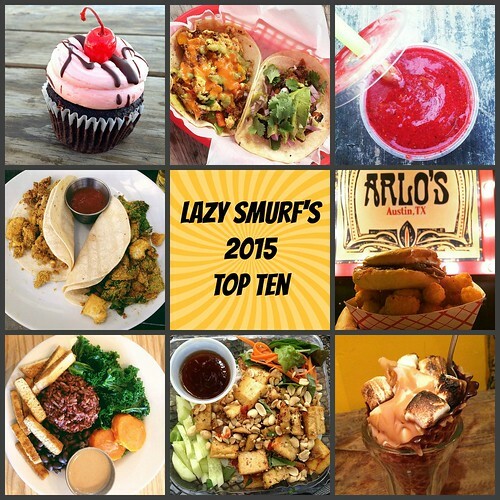 My favorite part was definitely Capital City’s cheesecake. Soooo goooood.